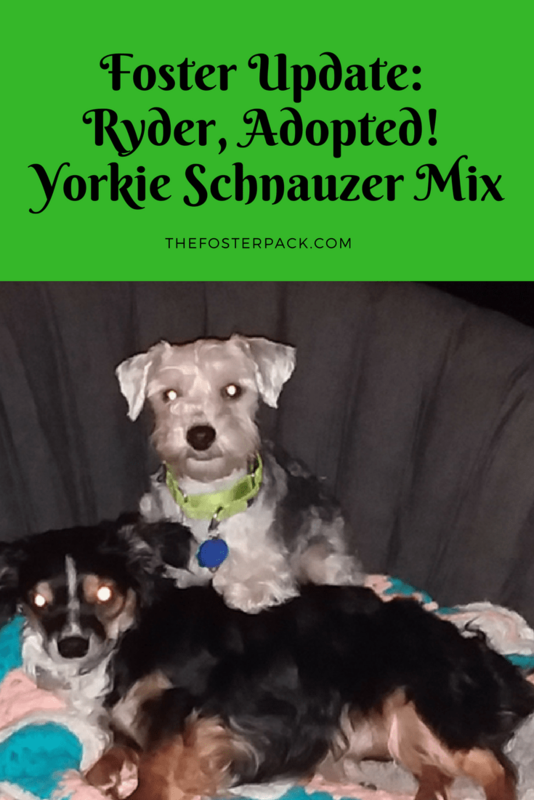 Home > Animal Shelter Volunteering > Animal Fostering > Our Foster Dogs > Foster Update: Ryder, Yorkie Schnauzer Mix, Adopted! Woo Hoo… After just over two months with us, Ryder will be going to his forever home this week. So we’re trying to enjoy our last few days with him. Ryder has been one of our more challenging foster dogs. But only in relation to the other dogs in the house. He’s never gotten over his obsession with picking on the big boys, Jackyl and Chewy. But I’m proud of them, they might have, tried, to put him in his place a few times, they were always gentle about it. When the other dogs were not around, Ryder was a good boy, who listened well and was pretty quiet. He has even lost the need to have a toy in his mouth constantly, and only carried them around sporadically. We’re so happy for him! And we won’t have much of a chance to miss him, as his new home is about 800 ft from us. He’s going from being my foster boy, to being my nephew. His two new girls and his mom are so excited about adopting him. Ryder will be their first own dog, although the girls have helped up here with ours for years, and with other family members animals. Luckily, Ryder’s new dad has lots of dog experience, and even Schnauzer experience. His two new cat siblings are not so excited. But hopefully, will learn to tolerate him. And eventually, come out from under the bed. He pretends they don’t exist, apparently in Ryder’s mind, cats are not even worth notice. Although their food is. And Ryder will still be able to see his favorite playmate, Cami. She will miss him terribly. Luckily, she always perks back up when the next foster dog playmate arrives (And we’ve already got word about helping a scared Japanese Chin). Plus, she does still have The Unexpected Eight to play with, at least twice a day when they get released from their pen for playtime (while I clean the pen good, of course), she hates to be put in the pen with them.